Alma Herman and Hazel Salina Loveridge Buhler: Alma was born Jan 16, 1892, in Midway, Utah Territory to Gottfred and Louisa Barben Buhler. His father owned a creamery and Alma would deliver milk with horse and buggy to Midway, Heber and Charleston. He always loved cows and horses and began milking at the age of four and continued until his death. He was a big, strong man and could do a lot of work-for a few months he worked at the brick yard in South Salt Lake and he unloaded a 60 ton train car load of coal every day. When he was 22 his mother died and his family split up and he went to Idaho for a while then came to Highland and bought a farm. He was almost 25 before he married Hazel Salina Loveridge of Highland. She was born November 15, 1895, to William and Martha Creswell Loveridge. They were married October 18, 1916, in the Salt Lake Temple. They had eleven children: Lilly, Ruby, Eva, Reuben, Herman, Fred, Elmer, Violet, Lyman, Sylvan, and Sanford. Reuben died at the age of eighteen as a result of a car accident on the “Highland Bump” (Mitchell Hollow). Alma was purchasing about 140 acres on the northwest and more than 50 acres on the southwest corner of 10400 N and 6000 W. They had a nice home (#83 - Highland map - interactive, large), a car and wonderful teams of horses. 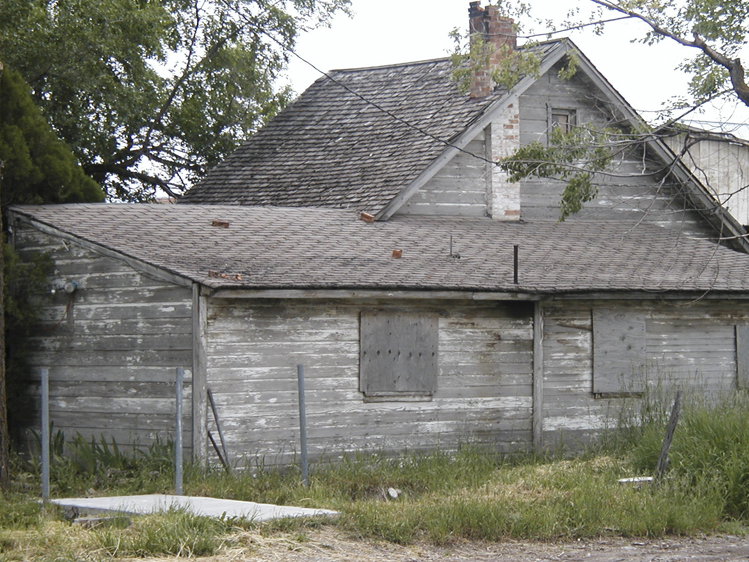 Then came the depression and, unable to pay the taxes, he lost the home and the 140 acres and had to move across the street south (#81 - Highland map - interactive, large) and lived the next winter in a chicken coop and a beet wagon box with a canvas cover. They all somehow survived, including a new baby born that winter (1931). Alma’s story is filled with miraculous incidents of survival-one example: in 1931, after the loss of his farm, he was hired to dig a well for Hyrum Groesbeck who lived on the Alpine Highway (#63 - Highland map - interactive, large) and while he was down in the well a rock got loose at the top, and when he raised his arm to protect himself the rock hit the arm and broke it. He had to be raised out of the well by windlass and Mr. Groesbeck took him to an American Fork doctor in his Model T to have the arm set. On their return northbound on the Alpine Highway, they were forced off the road and the Model T landed on top of them in the borrow pit. Alma was able to get his feet under a part of the car and raise it off them for a few minutes until they were rescued. Alma broke 3 ribs in the crash and at the time he was trying to put together the chicken coop for his family to live in. His pregnant wife helped him hold boards in place while he pounded in the nails. He was able to work in the grain harvest for Alvie Green on the dry farm but had so little food that he didn’t take any lunch. Mr. Green noted that and gave him some flour for his family. When he got it home the children were so hungry they began eating the flour right out of the sack. The money he earned in the harvest went to make a payment on the land and to install a wooden floor and windows in their home. Their eighth child, Violet, was born in November and Christmas looked to be pretty bleak for the children. The school always had Santa bring treats to the children at school on the day before Christmas so when they were at school that day Reuben told Fred to save his candy and nuts for the children at home because that’s all they would get from Santa this year. Close to midnight that night in a terrible blizzard there came a knock at their door and Mr. Irving Pratt, the American Fork fire chief was there with a bag of dolls, toys, candy, nuts and oranges for everyone. He had overheard Reuben at the party and had solicited help from the other firemen and brought the gifts up himself. He got stuck about a mile away from Buhler’s and had to walk the rest of the way in the blizzard so asked Alma if he could help him get back home. Alma hitched up a team of horses and went with him and got him freed and sent him on his way then returned-reaching home about two a.m.
Fred Loveridge and Ruby Rey Lee Buhler: Fred, the sixth child, third son of Alma and Hazel Buhler, was born May 26, 1927, in Highland. Fred was an enterprising young man and began raising his own chickens when he was ten years old. He graduated from American Fork High School and was drafted into the Army Air Force in 1945. He was discharged in December 1946. Ruby was born January 25, 1929, in Los Angeles, California to James Harold and Jennie May Woodbury Lee, the fourth child in a family of eleven. Her family moved to Utah when her father took a position at Geneva Steel. The purchased a farm in northeast Highland (#48 on the 1958 Highland map) and set up a grade A dairy. He hired local boys to help on his farm-some of whom were the Buhlers and thus Ruby and Fred were to meet. They were married June 2, 1947, in the Salt Lake Temple and set up housekeeping in a tent with a wooden floor (#14 - Highland map - interactive, large) but moved five more times before settling in a home on twenty acres they purchased from his sister Lilly and her husband Lawrence Day (#78 - Highland map - interactive, large) in 1950. Fred worked at Geneva Steel and they raised and sold tomatoes, watermelon and cantaloupe on their farm. They kept busy in church work and had a great deal to do with dancing in the MIA. They had fifteen children: Leroy, Brent, Chris, Sherilyn, Cathleen, Rosanne, Judy, Jane, Connie, Slade, Brad, Ben, Aleesa, James and John. The last two were twins and both died shortly after birth. The last few years of their lives were spent in an assisted living facility in American Fork. They died a few months apart in 2012 (Fred on August 21 and Ruby on Christmas day). Herman Nephi and Glenna Fae Jorgensen Buhler: Herman was born April 28, 1925, in Highland, to Alma and Hazel Buhler, fifth of their eleven children. When he was five he crawled under the car to watch his dad fixing it. When Alma was done he got out from under the car, got in the car and drove away, not realizing that Herman was there. The wheel of the car ran right over Herman’s stomach and they took him to the Dr who said if he had recently eaten he might have been killed but he was fine in a few hours. He played basketball at American Fork High School and was a good singer and was in some plays which gave him more confidence. He was drafted into the army where he served for one year then went to BYU for a semester before serving a mission in South Africa from 1948-50.